When you see EARTH and all as a myriad of different dimensions and timelines, with multiple universes within it, you will start to UNDERSTAND and REALIZE that Earth is not just one dimension, it’s a gazillion of them. Your OWN experience on this EARTH is your play that plays out for you. Your own dimension/timeline and you don’t get a higher vibrational one UNTIL YOU CHOOSE IT and EMBODY IT from within you. 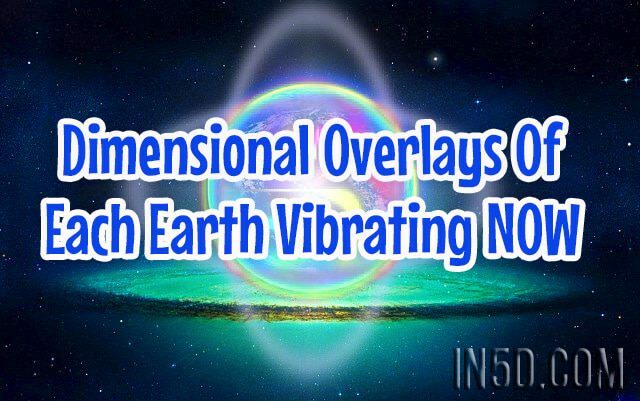 Instead of looking at the Earth as a the only reality as true, look at it as your dimensional version that you CREATED and HOLD THE VIBRATION for with every particle of you. Your transmission, your beliefs, your mentalities…. then look out there and see if the physical particles that have taken physical form are all that you DESIRE, fulfill your dreams, inspire you and enhance your soul/life now. IF NOT, then you are in an old timeline, which is a vibrational MATCH to some sort of separation that you still hold inside. It’s up to you to change your vibration and shift, intentionally, constantly, continually, until you have achieved the vibration you desire to experience ALL OF THE TIME. If you want a different reality, YOU have to do this…. for EMBODIMENT of higher light frequencies and the purity of LOVE is what gives you the ability, yes, YOUR ABILITIES, to do all easily, naturally and organically from within. Dimensions overlay, weave in and out. You are standing next to Angels, Christed BEings, ArchAngels, Ascended Masters, Galactic LIGHT BEINGS (us) all of the time, but if you don’t hold the vibration, you can’t see us, interact with us, until you shift your own vibration to vibrate into OUR REALITY here…. now. When you stop “thinking” it can’t be, you open up to the opportUNITY to actually experience this too. It’s not up there/out there, it’s all around you. Which physically solid hologram are you tuning in to, tuning your whole body to… in every moment. Tune to a higher frequency to vibrate into a higher frequency existence…. This is an entire EVOLUTION into HIGHER FREQUENCY BANDWIDTHS of EXISTENCES… that will continue until all of the lower bandwidths are gone/dissolved/dismantled and re-constructed in a whole new frequency (de-materialization/re-materialization). Yes, right now. Which vibrational body, Earth, reality are you HOLDING ALL OF THE TIME…. you will oscillate and re-tune constantly as your priority becomes your own existence and which Earth you are on RIGHT NOW. These higher Cosmic Galactic Source Purity Christed frequencies change your vibration, change the density of physical matter on Earth, you, your whole inside/outside world. Earth is a vibration, the Cosmos is a Vibration, You are Vibrations where matter, stardust, particles… have taken physical form.